The Endurance B2R recumbent exercise bike by Body Solid gets good reviews thanks to a smooth and quiet flywheel, and one of the best warranties in the business. The matrix LED information window shows time, distance, speed, calories, and pulse. The console operates on two AA batteries and will shut off automatically after a few minutes of inactivity. 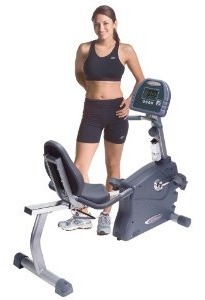 The Endurance B2R recumbent exercise bike features 15 levels of electromagnetic resistance and a heavy 24-lb flywheel. It has oversized Dura-Firm™ seat padding and an adjustable sliding seat on an aluminum seat rail with a quick-release lock for easy adjustments. There are contact heart rate sensors on the handlebars to check your pulse during workouts. The front transport wheels allow you to wheel the bike out of the way when not in use. The stated user weight capacity of the Endurance B2R recumbent is 400 pounds which seems overstated, as this is only a 125-pound frame, so we would recommend you try this out first in person if you are a heavy individual looking for a bike to help you lose weight. Still, this is a Body Solid company and they are known for building quality products. In fact, this Endurance model comes backed with Body Solid’s lifetime warranty that covers wear parts, upholstery, brake system – everything. Forever. 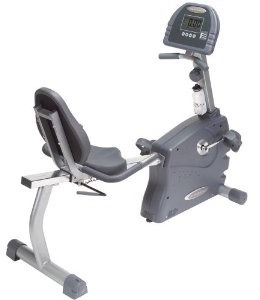 The Endurance B2R recumbent exercise bike deserves its praise thanks to its solid construction and outstanding Body Solid warranty. The only question then is what is a fair price to pay? Be sure to check Amazon which consistently offers the most competitive price on this model – when we reviewed it, it was priced at around $799. You can also find it at Sears and other retail stores for about $849 to $899.